There are various planes which are very similar to the earthly world in their quality and which are neither "dark" nor "bright". These are suitable places to live out wishes. An unfulfilled wish is a burden that prevents the person from getting on. It was already mentioned in the articles about lower planes (see Hell Planes: Self-Punishment and Hell Planes: Lust and Aggression) that the opportunity exists there to realise wishes. In near-earth planes, these wishes can range from very unsocial to harmless. For instance, many have harmless wishes to be able to fulfill their sexual desires. The corporal drive does not exist anymore on the otherworldly plane, but there still exists the wish itself, which has been established during the material life – the wish to finally get rid of the social and marital chains so as to satisfy the physical needs. Further harmless wishes are e. g. to have endless leisure time and not longer to be subject to the obligation to work. These otherworldly people have their pleasure in strolling through the landscape, sitting on a bench and having a chat with others. It has to be considered as a big help if a wish can be lived out in the world beyond in a more harmless way, so that it is not necessary to incarnate just because of such a wish. We should be grateful for that. There is one common aspect of near-earth planes that is worth to be mentioned. Many people do not believe in an afterlife. Everything which is told in religion – or in more recent texts like this one – appears, in their eyes, to be unproven and speculative. This is a behaviour which has its justification and which any understanding person will respect. However, when these people realise that they are actually living on after death, they often are pleasantly surprised; and what is more, they want to compensate their lack of informations with a newly arising thirst for knowledge. There are enough "knowing people" on the near-earth planes – "knowing people" which see themselves confirmed in their religious or transcendental opinion. Thus, they believe that they have the advantage of real knowledge over the so far uninformed people – which unfortunately is not true in most cases. Real knowledge does not base on intellectual speculations, but on experience – and on the near-earth planes, people are rare which have experiences about higher planes or cosmic dimensions. Another interesting aspect of near-earth planes is the so-called Dream Plane, although it does not exactly describe a ‘plane’ as such but rather the state of the people which can be met there. It is a near-earth area of the astral realm in which unconscious astral travellers ("dreamers") can be encountered, and it is very likely that we ourselves are often wandering about like this when having an unconscious OBE. Happenings in the near-earth area can be very diverse, as can be seen in the following examples. "The street wound between slender, three- to four-storey half-timber houses, sometimes narrow and half roofed by oriels, sometimes expanded through small squares. This architecture is totally unknown at the place where I live, so this walk was especially attractive for me. I strolled along the streets, attentively observing every detail. I liked this old town which seemed to have grown organically and not determined by functionality. With highest pleasure, like a tourist, I strolled along the streets which sometimes appeared compacted, then again broader – and as if the streets had been expanded there like stages, I could see a colourful hustle and bustle of archaically dressed people there. The footworn cobblestone, made of stones of different size, complemented the individual appearance of the houses with their oriels, archways, stairs and their facades made of tiles, wooden boarded porches, their walls partly made of natural stones, sometimes with sgrafitto decorations. Nothing was repeated, everything was individual and unique. I was enchanted. I wormed my way through the crowds of people in their medieval, colourful clothes, and turned into a side street. A few steps further, I saw a passage on the right side. Passing through it, I came to a large courtyard. There I stopped and looked around so as to take in all the impressions. A man came running, after him another, and they already started a brawl. More and more men joined in there, until it was a chaotic bunch of people. I looked at this hustle, surprised, and went on. But soon I was coming out of the state and I stayed awake for a long time so as to wander through this beautiful and strange city once again in my memory." "I had flown through a kind of tunnel with dream-overlay, and finally, after about a minute of flying in dorsal position, I slowly got up (passively), whereat my surroundings became gradually visible. I found myself in a kind of two-part banqueting hall where many people were gathered. 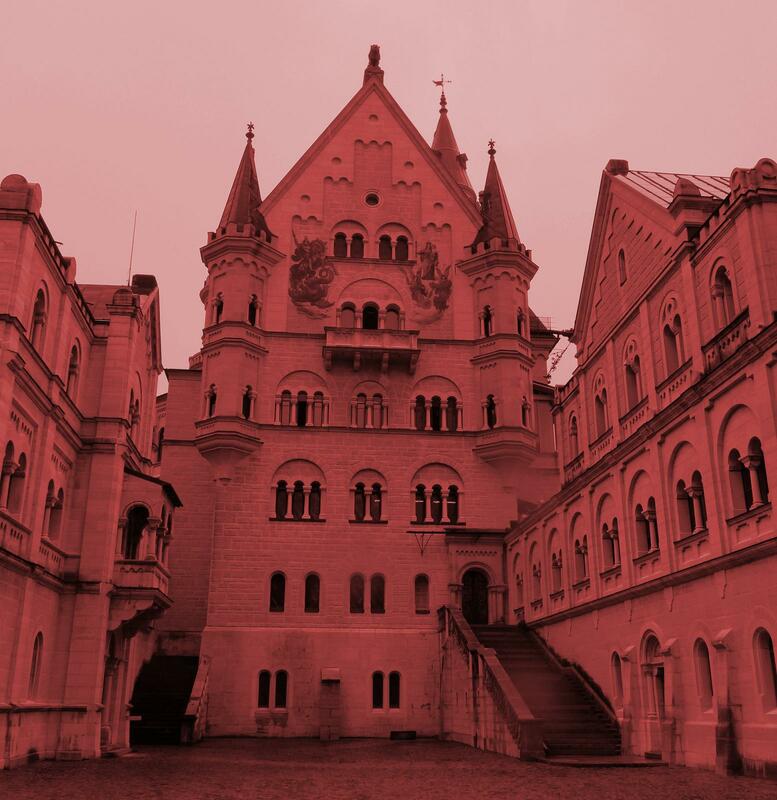 Everything was pompously furnished, like in a castle, with red curtains and ornaments. I didn’t pay much attention to the surroundings, which I regretted much afterwards, but I rather observed the people. They all were dressed in splendid, colourful clothes, men and women alike; their clothes and also the ballroom looked like from a different time, very similar to the style of the 18th century. The women had wide, richly coloured dresses and pinned up hair. The men wore clothes that were partly splendid, partly military, and they wore these ridiculous stockings which were common at that time. I don’t know how I should describe it, I don’t know much about fashion and things like these. However, the men wore rapiers on their belts, and many of them had moustaches and pointed beards. So far the description of the appearance. When I suddendly turned up there, I seemed to cause surprise and also anxiety, because many of them uttered cries of surprise or shock as they saw me suddendly standing there. Some of the men got up immediately and gripped the hilts of their rapiers, but didn’t draw them yet. I wondered where I had landed. I was very embarrassed that I had burst into the middle of such a festivity. Moreover, I was sceptical at once, because I had landed in strange places before and had been tricked there, so I had learnt from the past and was more alert now. I tried to stay calm and not to give them a reason to attack me. At first, I did not speak directly to them, but I rather communicated to them through my auric radiation that I only had landed here unintentionally and that I did not want to harm anyone. Then I went to the part of the ballroom where more women sat, because I wanted to stay away from the men with their rapiers. The people sat around tables and some of them ate or went on with conversation, because their anxiety had vanished now that I had made clear I had no bad intention in any way. Some of them had encrusted, black stains in their face. It looked like a disease, but I am not sure. I turned to some of the people and asked them if they had seen someone I was searching for (that had been the original reason for my tunnel journey, but obviously it had not succeeded). But they had not seen him or any similar person there. I somehow felt that these people – at least some of them – had more knowledge than normal and they knew exactly that they were in an otherworldly plane. They did not live in ignorance of their death. I said thanks to them for helping me and left the banqueting hall through a wooden door that led into a small entrance hall. They seemed to be relieved that I finally left their festivity. I had the impression that one or two of the armed men were following me into the entrance hall, so as to make sure that I really was about to leave and did not plan anything evil. I did not care, I would leave this place anyway in the next moment. I stood before the exit door and concentrated on my Anahata. Again I flew through the darkness until I fell back into the etheric state." "I was standing on a hill, in the middle of a wonderful, light woodland, and everything was very colourful and bright and so within reach; the bark of the trees and the grass and the leaves and everything. I went through this forest, or rather floated through it, at least partly. At the edge of the hill I had a view over the whole landscape; there were flat hills covered in forest everywhere as far as the eye could see, and down in the valley there was a small town with narrow and winding streets. It reminded me of the place where I live, but there was more forest and more mountains. I took off and floated over the landscape, everything was colourful and beautiful and pin-sharp imagery, sharper than I could see in the physical world even without my myopia. For a moment, I was unsure if to fly to the mountains so as to find a silent place. But somehow I wanted to take a closer look at the town. I flew over the valley. All the houses were very old and beautiful to look at; half-timbered houses and others of similar kind, and all the streets were cobbled. It had a slightly medieval ambience. This small town was relatively scattered over the whole valley and many houses were hidden amongst trees. There existed a kind of main street, on which I landed to explore the surroundings; partly walking, partly floating. This time I talked to no one, I just watched instead. There were quite many people walking around there for such a small town that lay in the middle of the forest. Some of them wore strange clothes. I especially noticed that all the women were dressed in skirts and all the men in trousers, just like in former times. A married couple with an adolescent came my way; they looked a bit grim and said Hello to me. At first I was puzzled, but then I greeted back, whereat they got friendlier at once. I tried one of the side streets, but it ended soon and I stood before a house. I turned back, but from a distance I saw two persons standing there and greeting me. I wondered if I had been here before, so that they knew me, or if they just greeted out of friendliness. 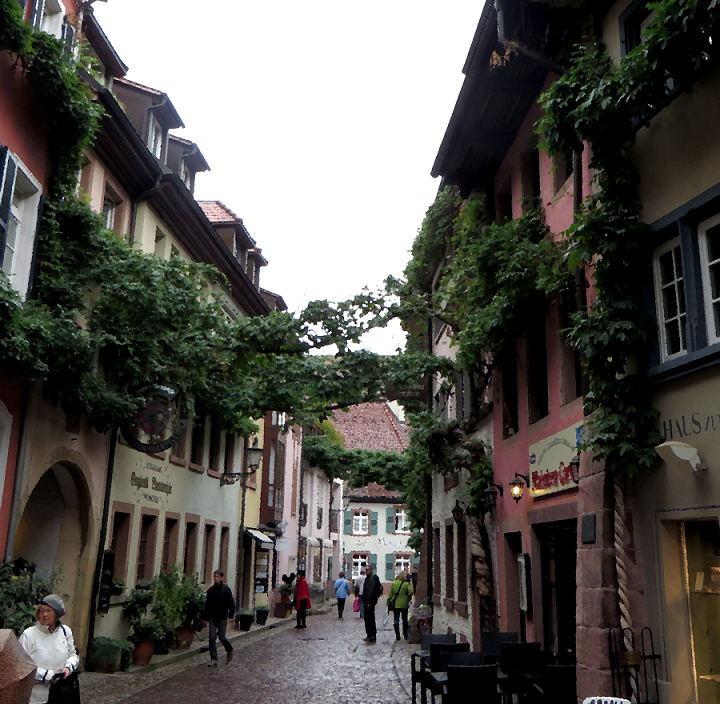 However, I tried to find my way through the winding streets and kept watching for something that was familiar to me. But I didn’t find anything, so I flew away and turned to the forest-covered mountains again to find a silent place for me to connect. Unfortunately I was drawn back into the physical before I could fly any further."